We become so accustomed to the way things work, that we stop thinking outside the box. 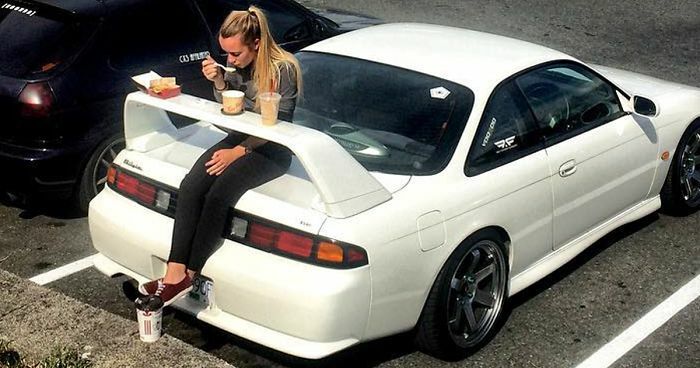 What if we told you that your old ladder can be a bookshelf, or you can use car's spoiler as a picnic table? To get your creative juices flowing, Bored Panda has put together a list of easy and incredibly useful life hacks, DIY tricks and repurposing ideas. From how to open a sealed plastic bag to how to keep ice-cream from dripping on your hands - they will all most definitely simplify your lives. Keep on scrolling to take a look. You'll thank us later. Life hack from Hans: do not have a car spoiler, unless you have a car that really need it. I did this 50 years ago when my wife dropped her contact lens. I needed to see this! My dog will lose his mind!! I'd have to mount it like 10 feet high so he doesn't get it! Need to cut the bottoms of bottles first? How to? Holy crap!!! I am going to totally try this...those packages are a bugger to get into. This is genius!! this is actually a good one, and also adds to the flavor. I find it works best with Chardonneys. Do you know anyone who has an old seat belt lying around? They normally get sold with your old car. They sell "ladder" shelves basically just like this for like $100, easier to make ur own! Really like this one! Might do this for my future kids! I've seen this great suggestion before. I've got to remember to try it! #19 Save Space And Hang More T-Shirts This Way! So cute I love this just need support so you don't break the back leaning on it. If this actually works I'm going to need a lot of walnuts. Lego used to sell a keychain holder. i got one before it was discontinued - and i LOVE IT! i wish i could share a pic! What happens when they grow the roots have no room. I call this plant abuse. not a fan of that look. Straw your strawberries I love this idea. My wife did this in our house. She's not the only one! Hmm... salt and vinegar cleans pennies. Would adding salt here help? No. I don't want to embarrass my dog. great for reading in the dark!! Takes up a lot of space, os not very useful, makes cleaning hard.. Why not just sell the bike or donate it to people who send bikes to African countries where they get a second life? Saves me from ruining my nail polish! Does this work to artifical suede too? And then, according to the picture, maybe glue them to the wall? If only they had a couple of holes for nails or screws. those are TENNIS rackets, mind you. wooden frames. old school. Not a bad idea but you need room to plug in the cord to the phone plus you'll ruin your cord if you have bent all the time. And you get a delicious melted ice cream marshmallow at the end. To yummy! Or just use your laundry pegs. Lunch thrown away by colleagues: excellent! As long as you have the tool. Or just buy picks. They can't be that expensive that the punch would be better. The yellow one looks lame. The bench is awesome. Only a true skateboarder can appreciate a used and best up Board. The yellow one is for posers. This just transfers the mess to a different stage of the process, loading it into the bottle, and cleaning the bottle once finished. I will stick with a ladle. My father made one for my step mom (pintrist idea) it works well.His experience as a carpenter really paid off it looks amazing.